There is a growing need for and appreciation of bright, uncluttered spaces in our culture. The lavishness of our lives, multitude of everyday actions, constant visual stimulation provokes us to build retreats, home sanctuaries, where we can calm down and breathe. This inspires designers to search for purity, simplicity and minimalism in their work. And what can be simpler, cleaner and more assuring than white? White paint can be made of many things: chalk, gesso, zinc oxide, titanium dioxide, barium, powdered lime, rice, fossilized sea creatures, burned lamb bones, seashells, eggshells, pearls, marble, alabaster, quartz or lead – the greatest and the cruellest of all whites. In prehistoric times gesso and lime were the first whites available. Later, from Greece came the lead white – the perfect, famous and poisonous white. Toxic lead white was used by artists for hundreds of years before it was banned in the late 20th century. It was used not only as canvas primer and to create various colours and highlights, but also in the cosmetic industry with fatal consequences. The modern whites are mostly made from zinc and titanium and they have replaced the lead white both in art and industry. White has always been a controversial colour due to its ephemeral, bright, pure, seemingly cold, futuristic or lacking vibrancy qualities, but history of white is colourful and exciting. In 1859 James McNeil Whistler arrived in London to make the name for himself as an artist. Coming form the different aesthetic background, he was horrified by the culture of the Victorian society – their food, their clothes and their bad taste in art. His inspiration came from the novel ‘The Woman in White’ published in London and written by Vicky Collins. The book was a sensation and Whistler used colour white to mock witless Victorian taste. He painted a series of paintings depicting women in white. On the pictures, both portrayed women and the background were covered with all shades of white, which baffled the general public but gave clues to the intellectual elite. Whistler enjoyed the controversy. Since that very moment white became his signature colour – he dressed in white and lived in the white house with a white dog, but the story goes on. In 1883 Whistler opened the exhibition of new pictures painted on his trip to Venice. He displayed the paintings on the white walls; the picture frames where white, the art work was monochrome and hanging so sparsely that the gallery felt empty. It was a discomforting and alien experience for the Victorian society who adored their knick-knack cluttered interiors. But that was the precise intention. Art became exclusive for intellectuals and artistic elite. Whistler called the exhibition a masterpiece of mischief and it became his lasting, powerful legacy. The white gallery spaces are almost compulsory in the art world today. In 1925 Le Corbusier wrote the manifesto how architecture could cleanse the world. The secret weapon of the manifesto was Ripolin – a white emulsion paint. According to the manifesto, every citizen was required to cover the walls, floors, ceilings and furniture in his house with a plain coat of Ripolin. White became the negation of the superfluous, Bourgeois decoration. White was the way to clean homes, minds, bodies and to regain integrity. But white wasn’t just a colour, it was a message – a sign of transition from the old world to a new world. The villa Savoye is the perfect example of this change - pure forms and shapes fill the white, modernist space. 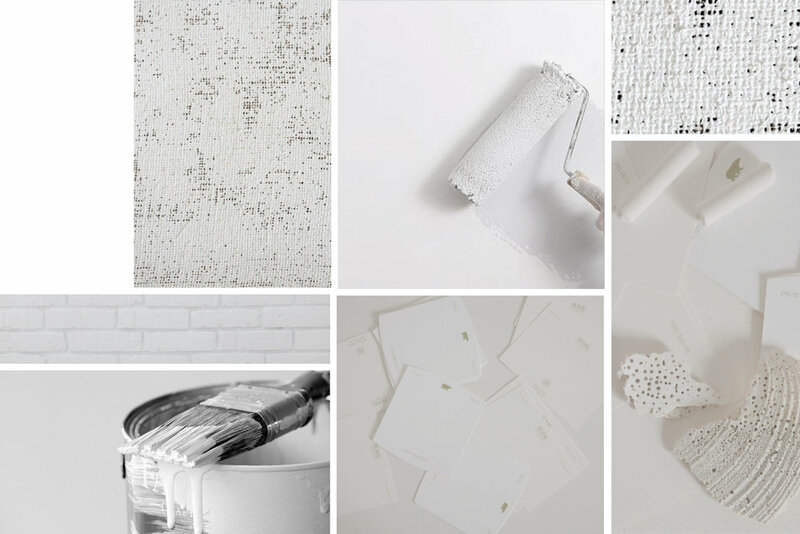 There are endless permutations of whites, off-whites, cool whites and warm whites heading toward ecru and bleached neutrals like a weathered wood or bone white. White enhances the sense of space and makes the most of the available natural light, and space and light are two aspects we prize the most in our interiors. White can calm the noise, reflect and brighten the space and get rid of gloom. White painted rooms seem bigger because it is difficult for the eye to focus and to find corners in blank white space. The difference between the floor, the wall and the ceiling disappears leaving no limits for the space. But none of us lives in an empty white box. White is just a design element which helps us to find clarity in our interiors. The white colour scheme and sparsely decorated room is restful and allows the eye to slow down. Whitewashed walls create a neutral backdrop for the art and our colourful lives. Painting a space with a variety of whites can lead to a subtle and conceptual design. An important thing is to find the right white responding to our personal taste and to the ambience. Warmer, toned-down, ‘old whites’ are well suited for more classical interiors. Soft whites merge gracefully with old furniture or traditional decoration and match the long-established atmosphere of the house. In the more eclectic interiors, with the mixture of new and old furniture pieces, bright whites can provide dramatic background to historical elements while keeping with the modern aspects of the interior. Clean, clear whites are suitable for modern and ultra modern interiors. The white used in contemporary interiors should not divert into warm or cool colour direction as it could create an appearance of an old and dirty space. The representation of true white is a plain, white copy paper – comparing it with the colour sample helps to choose the right colour for the interior. The colour of some architectural elements, like windows for instance, can affect how we see the space. White window frames slow your eye down and keep your focus on the things within the room boundaries, which is a useful trick when the view outside is not particularly interesting. Currently however, in vogue are black window frames, which allow your eye to travel to the outside easily and they are great for bright rooms as they recede and demand little, creating a beautiful contrast to whitewashed walls. As everything in design this is a question of personal preferences. There is also a notion that elements like door frames, base boards, crown mouldings and chair rails should be painted white. This reduces the visual stimulation, eliminates the graphic, linear appearance created by the contrasting trims and unifies the spaces. This is particularly suitable for rooms with rich architectural ornamentation, where white calms the space down, but shadows add drama to it. Apart from the tone of white, the surface quality also affects how the white is perceived. In general, glossy surfaces reflect light and obscure colour, making the space visually stimulating. Dull surfaces absorb light and make colour to appear denser and the space calmer. Flat – looks powdery and has no shine at all. This is the best finish for hiding imperfections and emphasizing the colour. It is often used on ceilings. Matte – is a washable lowest-sheen paint. When dry, looks almost like flat paint but is resilient and mar-resistant when washed. Eggshell – has a low sheen and is used on the surfaces that are subject to occasional moisture and abuse (kitchens, bathrooms, kid’s rooms). It is easy to clean. Satin – it has a sheen, but it is not glossy. Popular finish for trims and cabinets. It is easy to clean and durable. Semigloss & High Gloss – add glamour to cabinets and floors, bounce the light off, emphasize every tiny imperfection. Surface preparation becomes more critical as the sheen level increases. When searching for the right white for your home, it is good to refer to the whites which already give you a comfort and sparkle joy. Some might find cool white of subway tile pure and refreshing, whereas others would prefer warm white of washed linen. This is again, the matter of personal taste.